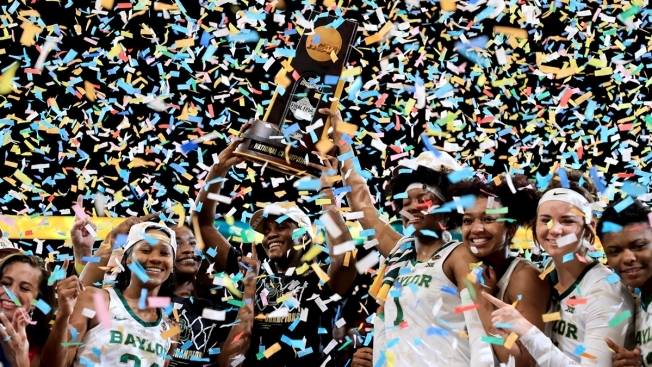 The Baylor Lady Bears celebrate with the NCAA trophy after their 82-81 win over the Notre Dame Fighting Irish during the 2019 NCAA Women's Final Four Championship Game at Amalie Arena on April 7, 2019, in Tampa, Florida. Kim Mulkey and Baylor might not have to wait another seven years to win another national championship. They also have those talented youngsters known as the "Fierce Five" -- Baylor's 2018 top-ranked signing class, a group of five five-star recruits who as freshmen were part of a championship season.